I've said it before, and I'll say it again, this book has good bones. Ophelia and the Marvelous Boy is filled with all the things I love in a good Middle Grade novel. A quirky, young heroine, a tale filled with magic, and a setting that is just too good to pass up. Who wouldn't want to wander a giant museum full of oddities? Still, this book just didn't have that magic I was looking for. I'll do my best to explain. I do have to give credit where credit is due, and admit that Ophelia Jane Worthington-Whittard is a charming protagonist. I have an affinity for characters like her. Quirky, small, underdog type characters who fight against the odds to accomplish the impossible. What's not to love? I remember being a young reader and wanting, more than anything, to be just like the girls I read about in my fantasy books. Even now, reading this as an adult, I see what I'd love about Ophelia as well. Sadly, I didn't feel like the story written around her was worthy of our little Ophelia. While everything I wanted to see was there, it just felt off. This story has talk of wizards, giant owls, and even ghosts, but none of it had that spark that made me want to read like mad. There were parts that felt like they should have been exciting. Pieces of this story that were written to show Ophelia standing tall against things she should be afraid of. None of it felt real though. It felt a bit flat I think. I missed the magic. I do see a lot of good in this book. 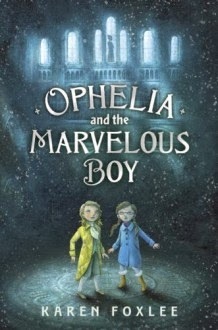 Ophelia and the Marvelous Boy seems like an excellent read for a parent to share with a younger child. I kept picturing this being read to me as a bed time story, and it seemed to fit the bill. So three stars it is. While it wasn't my favorite read of the year so far, I'm much to smitten with Ophelia Jane Worthington-Whittard to give her anything less.